Experimental autoimmune encephalomyelitis (EAE) induced by sensitization with myelin oligodendrocyte glycoprotein (MOG) is a T cell-dependent autoimmune disease that reproduces the inflammatory demyelinating pathology of multiple sclerosis. We report that an encephalitogenic T cell response to MOG can be either induced or alternatively suppressed as a consequence of immunological cross-reactivity, or “molecular mimicry” with the extracellular IgV-like domain of the milk protein butyrophilin (BTN). In the Dark Agouti rat, active immunization with native BTN triggers an inflammatory response in the CNS characterized by the formation of scattered meningeal and perivascular infiltrates of T cells and macrophages. We demonstrate that this pathology is mediated by a MHC class II-restricted T cell response that cross-reacts with the MOG peptide sequence 76–87, IGEGKVALRIQN (identities underlined). Conversely, molecular mimicry with BTN can be exploited to suppress disease activity in MOG-induced EAE. We demonstrate that not only is EAE mediated by the adoptive transfer of MOG74–90 T cell lines markedly ameliorated by i.v. treatment with the homologous BTN peptide, BTN74–90, but that this protective effect is also seen in actively induced disease following transmucosal (intranasal) administration of the peptide. These results identify a mechanism by which the consumption of milk products may modulate the pathogenic autoimmune response to MOG. The etiology of multiple sclerosis (MS)4 is obscure but is believed to involve environmental factors that disrupt immunological self-tolerance to CNS myelin in genetically susceptible individuals (1). The selective activation and expansion of myelin-specific T and B cells in MS patients supports this concept (1, 2), but the identity and mode of action of the environmental factors that initiate or exacerbate this autoimmune response remain unknown. A major target for the pathogenic autoimmune response in MS and its animal model, experimental autoimmune encephalomyelitis (EAE), is the myelin oligodendrocyte glycoprotein (MOG). MOG is the only myelin autoantigen known to induce both a demyelinating autoantibody response (3, 4) and an encephalitogenic CD4+ T cell response (5, 6, 7, 8) in animals with EAE. The demyelinating potential of the MOG-specific Ab response has been studied extensively both in vivo and in vitro (4, 9, 10), and, in MOG-induced EAE, this humoral response acts synergistically with the encephalitogenic T cell response to induce a demyelinating pathology similar to that in MS (4, 11, 12, 13, 14). Although the encephalitogenic MOG-specific CD4+ T cell response initiates the recruitment of immune effector cells into the CNS and disrupts the blood brain barrier, demyelination in the rat is dependent on the presence of anti-MOG autoantibodies (4). These Abs bind to MOG exposed on the myelin surface (15) and mediate demyelination by a combination of complement and cell-mediated immune effector mechanisms (16, 17, 18). The observation that both MOG-specific T cell (19, 20) and Ab responses (21) are enhanced relative to other myelin Ags in MS suggests that demyelination involves a similar combination of immune effector mechanisms in the human disease. A concept supported by the recent demonstration that anti-MOG-Abs colocalize with myelin debris in actively demyelinating MS lesions (13, 22). However, the mechanism(s) that may initially disrupt self-tolerance to MOG in MS are obscure. Intriguingly, sequence homologies involving its extracellular Ig-like domain (MOGIgd) identified MOG as a member of an extended family of “B7-like”proteins (23). Of particular interest was the finding that the highest level of sequence identity, ∼50%, was with a homologous extracellular Ig domain of butyrophilin (BTN) (24), a major protein of the milk fat globule membrane (MFGM) (25, 26). This observation led us to speculate that immunological cross-reactivity or “molecular mimicry” with BTN may influence the function of the MOG-reactive autoimmune repertoire. In the current study, we report that this is indeed the case. In the context of a permissive MHC haplotype, we show that the CD4+ T cell response to BTN and MOG is mutually cross-reactive. Therefore, sensitization with native BTN can initiate an inflammatory response in the CNS mediated by a class II MHC-restricted MOG-reactive T cell response. Conversely, both intranasal and i.v. treatment with BTN peptide can abrogate MOG-induced EAE. The observation that transmucosal exposure to a BTN peptide can modulate disease activity in MOG-induced EAE suggests that, in the context of an appropriate HLA haplotype, dietary exposure to BTN may modulate the pathogenic autoimmune response to MOG in MS. Dark Agouti (DA) and Brown Norway (BN) rats (120–200 g) were obtained from Charles River Breeding Laboratories (Sulzfeld, Germany), and Lewis (LEW) rats were obtained from the animal facility of the Max-Planck Institute for Biochemistry (Martinsried, Germany). CFA, IFA, and heat-killed Mycobacterium tuberculosis (H37Ra) were purchased from Difco (Detroit, MI). Purified protein derivative was purchased from the State Serum Institute (Copenhagen, Denmark). Recombinant MOGIgd (amino acids 1–120) (12) and BTNIgV (amino acids 27–144 notation including signal sequence) (26) corresponding to the N-terminal Ig-like domains of the two proteins with a C-terminal hexahistidine tag were expressed in Escherichia coli. The recombinant proteins were purified by chromatography on Ni-NTA agarose to a purity of >95% as assessed by SDS-PAGE (Qiagen, Chatsworth, CA) and stored at −20°C. MFGM was purified from fresh bovine milk as described previously (25). Synthetic peptides were purchased from Genosys (Cambridge, U.K.). Rats were immunized s.c. at the base of the tail with 100 μg Ag emulsified in CFA containing 225 μg of heat-killed M. tuberculosis (H37Ra) in a total volume of 100 μl. Ag-specific T cell lines were generated as described previously (12). Briefly, the draining lymph nodes were removed 10 days postimmunization (d.p.i. ), and a single cell suspension was cultured for 72 h at a concentration of 107 cells/ml in DMEM supplemented with glutamine, penicillin, streptomycin, sodium pyruvate, essential amino acids (Life Technologies, Rockville, MD), and 1% rat serum in the presence of the selecting Ag (20 μg/ml). T cell blasts were then isolated by density gradient centrifugation and propagated for a further 5–10 days in medium containing IL-2. Ag-specific T cell lines were subsequently maintained by cycles of Ag-specific restimulation using irradiated (5000 rad) syngeneic thymus cells as APCs, followed by expansion in IL-2-containing medium. Cytofluorometric analysis was performed using samples of 2 × 105 viable cells washed with PBS containing 0.2% BSA and 10 mM NaN3 and incubated with the primary mAb for 1 h on ice. After washing, the cells were stained with fluorescein-conjugated goat anti-mouse IgG (Dianova, Hamburg, Germany) for 1 h on ice. After removing unbound fluorescein-conjugate by washing, the cells were analyzed using a fluorescence-activated cell sorter (FACScan; Becton Dickinson, Heidelberg, Germany). A live gate was obtained by incubating the cells in PBS containing propidium iodide. Proliferation assays were performed in flat-bottom 96-well tissue culture plates in a total volume of 200 μl using either 5 × 105 lymph node cells, or 2 × 104 T line cells plus 5 × 105 syngeneic, irradiated (5000 rad) thymus cells as APCs. Ag-specific proliferation was assessed by the incorporation of [3H]thymidine (10 μCi/well) during the final 16 h of a 72-h culture period using a Packard (Meriden, CT) Matrix 96 Direct β counter. Female DA rats (6–8 wk old) were treated intranasally daily for a period of 10 days with a dose of 50 μg of Ag (1 mg/ml in water), which was injected using a micropipette (25 μl per nostril). Three days after the last intranasal application of Ag, the animals were injected with 100 μg of MOGIgd in IFA. Adoptive transfer experiments were performed using activated T cell blasts isolated after 72 h restimulation with Ag in vitro. The T cell blasts were suspended in a volume of 1 ml DMEM and injected into the tail vein of female DA rats (6–8 wk old). Treatment with high-dose soluble Ag was performed using 500 μl of Ag (2 mg/ml in DMEM) injected in the tail vein 2 and 4 days after T cell transfer. Animals were weighed and examined daily for clinical signs of EAE that was scored on a scale of 0–5 as described previously. Histological evaluation was performed on paraformaldehyde-fixed, paraffin-embedded sections of brains and spinal cords sampled at various time points of disease. Paraffin sections were stained with hematoxylin-eosin, Luxol fast blue, and Bielschowsky silver impregnation to assess inflammation, demyelination, and axonal pathology. In adjacent serial sections, immunohistochemistry was performed with Abs against macrophages/activated microglia (ED1; Serotec, Oxford, U.K.) or T cells (W3/13; Seralab, Sussex, U.K.). Bound primary Ab was detected with a biotin-avidin technique as previously described in detail (27). Control sections were incubated in the absence of primary Ab or with nonimmune rabbit serum. LEW, BN, and DA rats were immunized with either MFGM, or alternatively BTNIgV in CFA and monitored for the development of clinical and/or histopathological evidence of EAE. Strikingly, although neither immunogen induced clinical disease in these rat strains, histopathological analysis identified a subclinical inflammatory response in the CNS of DA rats that was absent in DA controls immunized with PBS/CFA. 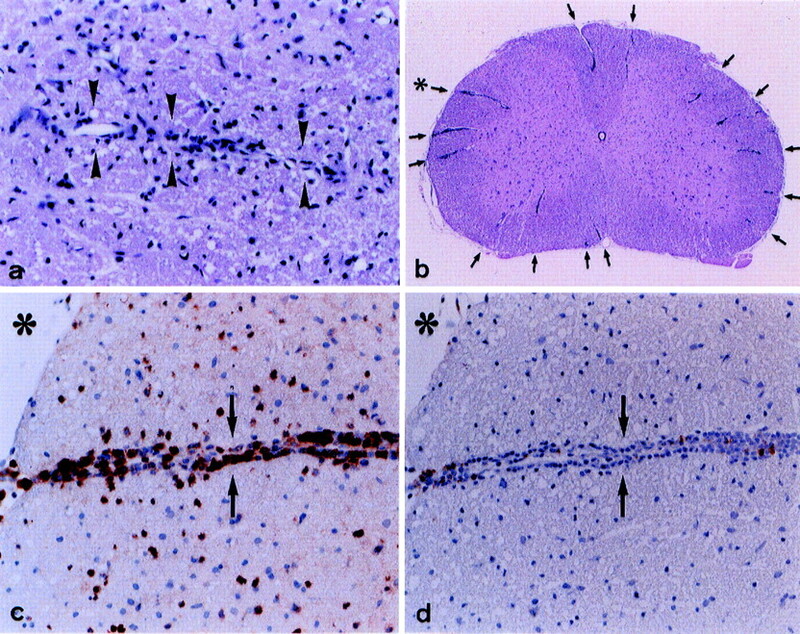 This pathologic response was characterized by the formation of scattered meningeal and perivascular infiltrates of T cells and macrophages throughout the CNS (Fig. 1⇓a). This is in contrast to the pathology of MOG-induced EAE in the rat that is dominated by Ab-mediated demyelination (28). In contrast, neither immunogen induced any CNS pathology in the other two rat strains. Moreover, no pathology developed in the CNS of DA rats immunized with PBS/CFA. These observations indicate that BTNIgV, a major component of MFGM, can act as a strain-specific encephalitogen in the rat. To test the hypothesis that molecular mimicry with MOGIgd at the level of the T cell response was responsible for the CNS pathology induced by BTN, we investigated the ability of BTN and synthetic BTN peptides to stimulate a panel of encephalitogenic class II MHC-restricted MOG-specific T cell lines (TCL) derived from LEW (MHC RT1l), BN (MHC RT1n), and DA (MHC RT1av1) rats. The encephalitogenic epitopes recognized by these TCLs are strain-specific and together span 70% of the MOGIgd sequence (Table I⇓). In agreement with the inability of BTNIgV to mediate an encephalitogenic response in either LEW or BN rats, MOG-specific TCLs derived from these strains did not proliferate in response to either BTNIgV or synthetic BTNIgV peptides in vitro. In contrast, DA MOG-specific TCLs proliferated in response to BTNIgV in the presence of syngeneic APCs. Using a panel of overlapping synthetic peptides, we demonstrated that this cross-reactive response was restricted to the overlapping BTN peptides BTN63–87 and BTN76–100 (Fig. 2⇓a). MOG and BTN provoke a mutually cross-reactive T cell response. T cell lines were derived from DA rats immunized with either (a) MOGIgd or (b) BTNIgV. Epitope mapping using sets of overlapping synthetic peptides spanning the homologous Ig-domains of BTN or MOG identified a cross-reactive T cell response to an epitope located between amino acids 74 and 90. a, DA MOG-specific T cell lines exhibit a limited proliferative response to BTNIgV that is similar to that obtained using the peptides BTN63–87 and BTN76–100, their overlapping sequence BTN74–90 and its MOG homologue, MOG74–90. b, A similar cross-reactive response was found when T cells specific for the epitope BTN74–90 were selected from the draining lymph nodes of BTNIgV immunized DA rats. However, in this case, although both MOGIgd and the peptides induced a substantial proliferative response, BTNIgV was relatively poorly processed and presented to the T cells in vitro. c, Recognition of their cognate peptide by MOG74–90-specific (▪) and BTN74–90-specific (□) TCLs is restricted by class II MHC (I-A). Addition of the mAb OX6 (anti-I-A), but not mAbs OX 17 (anti-I-E) or OX18 (anti-class I MHC), blocks proliferation in vitro (mAb concentration 10 μg/ml) The purified OX mAbs were kindly provided by Dr. R. Weissert, Stockholm. d, The peptides MOG74–90 and BTN74–90 stimulate MOG74–90-specific T cells to a similar extent over a broad range of peptide concentrations. The overlapping sequence of these peptides spans an encephalitogenic MOG T cell epitope for the DA rat, the peptide sequence MOG76–87, suggesting that molecular mimicry was restricted to this epitope and did not involve a second epitope located within MOG96–107 (Fig. 2⇑a; Table I⇑; Stefferl and Schubart, unpublished observations). We investigated this further using synthetic peptides corresponding to amino acids 74–90 of the IgV-like domains of the two Ags. Strikingly both MOG74–90 and BTN74–90 stimulated the MOG-specific TCL to a similar extent, inducing a proliferative response similar to that obtained with the recombinant Ag and the longer peptides (Fig. 2⇑a). Although the above observations demonstrate that the DA MOG-specific T cell response exhibits molecular mimicry with BTN in vitro, it remained uncertain whether this was responsible for the inflammatory pathology induced by active immunization with BTN in vivo. Therefore, we examined the BTN-specific T cell repertoire for evidence of a cross-reactive and encephalitogenic response to MOG74–90 using short-term TCLs obtained from BTNIgV immunized donors. Ag-specific TCLs were selected in vitro using a combination of the peptides BTN63–87 and BTN76–100 as the selecting Ag. After two rounds of restimulation in vitro, the encephalitogenic capacity of the TCLs was assessed by adoptive transfer into naive syngeneic recipients. The i.v. injection of 5 × 106 to 107 T line cells induced an intense inflammatory response in the CNS of all recipients (Fig. 1⇑b), associated with weight loss and hind limb paraparesis. Immunohistochemical analysis of the lesions revealed that they consisted of large numbers of T cells concentrated in the perivascular space. Migration of infiltrating T cells into the parenchyma was restricted and the recruitment of ED1+ macrophages into the CNS was minimal (Fig. 1⇑, c and d), a pathology similar to that described previously in the Lewis rat following the adoptive transfer of MOG-specific T cells (6). The observation that BTN63–87/BTN76–100-selected TCLs proliferate in vitro in response to MOG74–90 and MOGIgd, as well as the selecting peptides and BTN, confirmed that the pathogenicity of this T cell population could be attributed to cross-reactivity with MOG (Fig. 2⇑b). FACS analysis revealed that the TCLs consisted predominantly (>90%) of CD4+, CD45RO−, αβTcR+ T cells (data not presented), and blocking assays using the mAbs OX6 (RT1B), OX17 (RT1D), and OX18 (class I MHC) demonstrated that their Ag-specific response to B74–90 and M74–90 was class II MHC (RT1B)-restricted (Fig. 2⇑c). Therefore, BTN can be processed and presented in vivo to stimulate a mutually cross-reactive and encephalitogenic class II MHC-restricted T cell response to MOG in the DA rat. It is now appreciated that molecular mimicry can induce either a pathogenic autoimmune response or, conversely, tolerance, depending on variables such as the route of sensitization, dose, and adjuvant effects (29). This is of particular relevance for peptides derived from ingested Ags, as these will cross the gut mucosal surface and provide tolerogenic signals in the periphery (30, 31). Therefore, could mimicry with BTN be exploited to suppress an autoaggressive MOG-reactive T cell response and abrogate clinical disease in EAE? The tolerogenic potential of BTN74–90 was first investigated in EAE induced by the adoptive transfer of MOG74–90-specific T cells. In the DA rat, a dose of 5 × 106 MOG74–90-specific T cells induced a maximal clinical score of 2.5 ± 0.3 four days after transfer. Disease severity was dramatically attenuated following i.v. 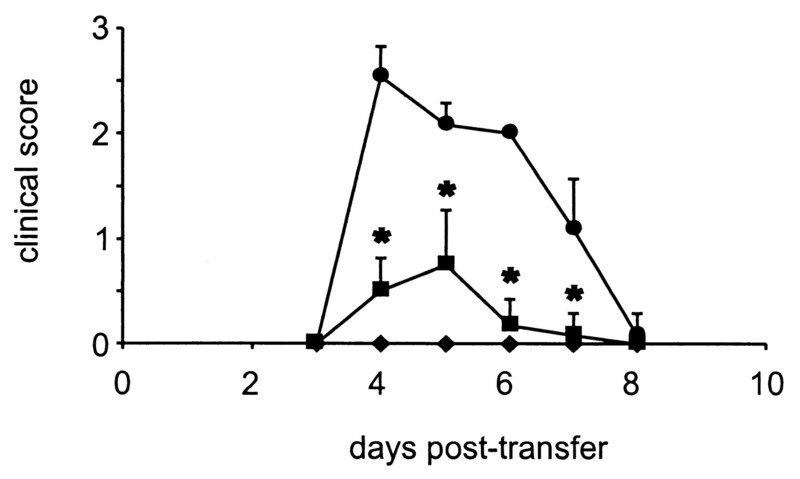 treatment with high-dose BTN74–90 given on days 2 and 4 following T cell transfer (Fig. 3⇓). The same treatment protocol using the nominal MOG peptide ligand MOG74–90 was even more effective and completely abrogated clinical disease (Fig. 3⇓). This differential in vivo effect was not reflected by the in vitro proliferative response of MOG74–90-specific T cells to MOG74–90 and BTN74–90, which was similar over a wide concentration range (Fig. 2⇑d). We are currently investigating whether this reflects differences in the pharmacological characteristics of the peptides in vivo, or differential effects of the BTN peptide on individual MOG74–90-specific T cell clones within the TCLs. 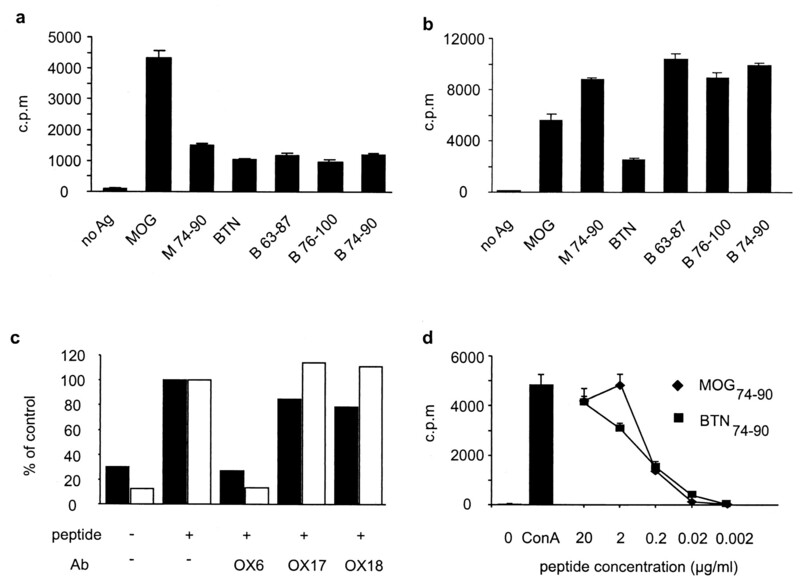 High-dose BTN peptide suppresses MOG74–90-induced EAE. DA rats were injected with a dose of 5 × 106 MOG74–90-specific T cells that induced severe clinical disease starting from day 4 posttransfer (•). Intravenous administration of 1 mg BTN74–90 (▪) or MOG74–90 (♦) 2 and 4 days after T cell transfer significantly inhibited disease. Injections were performed under light ether anesthesia; control animals were treated with OVA. ∗, p < 0.05; Duncan’s post hoc test. However, would transmucosal exposure to the BTN peptide have a significant impact on the course of EAE-induced by active immunization with MOGIgd? This disease model reproduces the complex immunopathology of MS and is mediated by a combination of both Ab and T cell-dependent effector mechanisms, including an encephalitogenic T cell response directed against two distinct epitopes (Table I⇑; Stefferl and Schubart, unpublished observations). In view of the complex immunopathogenesis of this model and that only one T cell epitope exhibits molecular mimicry with BTN, it was not surprising that intranasal treatment with any of the peptides when given individually (MOG93–110, MOG74–90, or BTN74–90) was unable to completely suppress clinical disease. Controls pretreated with OVA developed a biphasic disease characterized by an initial episode of EAE that was rapidly followed by a severe relapse that was normally fatal by day 25 p.i. (Fig. 4⇓a). Nasal administration of the individual peptides reduced disease severity, but failed to delay disease onset or stop disease progression beyond day 15, as demonstrated in Fig. 4⇓b for animals treated with MOG93–110. In contrast, the effect of treatment with combinations of either MOG93–110 and BTN74–90, or MOG93–110 and MOG74–90 was far more effective and both combinations of peptides delayed disease onset, penetrance, and severity (Fig. 4⇓c). This effect was clearly seen 20 d.p.i. when all animals in the control group pretreated with OVA were in relapse with a mean clinical score of 3.5 ± 0.32 (n = 6, Fig. 4⇓c). In contrast, at this time point, only two rats treated with MOG93–110/BTN74–90 combination (n = 5) had developed EAE (grades 1 and 2). A similar level of protection was also seen following intranasal pretreatment with the combination MOG93–110/MOG74–90 (data not shown). Therefore, the BTN peptide could be used interchangeably with the corresponding MOG epitope to modify the severity of actively induced MOG-EAE. Intranasal vaccination with BTN peptide ameliorates disease activity in MOG-induced EAE. DA rats were pretreated by intranasal vaccination as described in the text with (a) OVA (n = 6), (b) MOG93–110 (n = 6), or (c) a combination of MOG93–110 and BTN74–90 (n = 5). The experiment was terminated on day 20 postimmunization, by which time point the entire control group had developed severe neurological deficits. Treatment with a combination of MOG93–110 and BTN74–90 completely abolished the initial phase of disease and had a significant effect on later disease activity reducing the mean clinical score from 3.5 ± 0.32 to <1.0 on day 20. In this study, we demonstrate that, as a consequence of molecular mimicry, BTN, a common dietary Ag, can modulate the autoimmune T cell response to MOG, a major target in the immunopathogenesis of EAE and MS. This observation extends the concept of molecular mimicry to include dietary components as potential etiological factors in the immunopathogenesis of MS, which is a hypothesis that can now be tested and which may provide a mechanistic basis for epidemiological studies that link the consumption of milk and milk products to the prelevance of MS (32, 33, 34). Immunologic cross-reactivity, or molecular mimicry, involving microbial Ags and self is often discussed as one mechanism that may break self-tolerance to CNS myelin autoantigens in MS (35, 36, 37). This apparent lack of Ag specificity is a direct consequence of the degeneracy of TCR recognition of MHC/peptide complexes, resulting in the recognition of an extensive hierarchy of agonist and antagonist peptide ligands by a single TCR (38). Therefore, human T cell clones specific for MBP can be activated in vitro with synthetic viral peptides (39), and immunization with synthetic microbial peptides can induce an autoaggressive T cell response in vivo (35, 36, 37). However, whether or not mimicry involving microbial pathogens and myelin leads to autoaggression during the natural course of infection remains unknown. Our present study extends this concept to include mimicry with dietary Ags as a potential etiological factor in autoimmune diseases of the nervous system. Autoaggression induced by BTN is T cell-mediated and restricted by class II MHC. This limits the number of MHC haplotypes that are permissive for the induction of an encephalitogenic response to MOG. In our current study, we observed that only one of three rat haplotypes supported this response. In the context of the permissive RT1av1 haplotype, the cross-reactive T cell epitopes of MOG and BTN share a core region (amino acids 74–86) of which 8 of 12 residues are identical (Table I⇑). Although at least two other encephalitogenic epitopes of MOG in the rat exhibit similar levels of gross sequence identity with BTN, this is not sufficient to support a proliferative/encephalitogenic T cell response (Table I⇑). However, it is to be anticipated that non-MHC genes and environmental factors, such as the intestinal flora, will also play a role in determining the penetrance of this effect and the pathogenicity of the BTN/MOG-reactive T cell response. These observations suggest that, despite the extensive sequence identity that exists between the two proteins, only a limited number of human MHC haplotypes may be permissive for a similar cross-reactive T cell response. However, although active immunization with BTN in CFA induces a pathogenic autoimmune response, this is not the route by which the immune system is exposed normally to this Ag. BTN is a sexually dimorphic protein that is only expressed in the lactating mammary gland (23, 26, 40), and, therefore, with exception of lactating females, the only route by which BTN-derived peptides can influence or trigger an immune response is via the diet. It is now known that immunogenic peptides can cross the gut mucosal surface to be presented to T cells in the periphery within hours of ingestion (30). This directly influences the selection, survival, and function of the T cell repertoire and contributes to “oral tolerance,” the systemic suppression of potentially inflammatory responses to dietary Ags (29, 30, 31, 41, 42). Applying Ag intranasally provides an alternative route to study the induction of transmucosal tolerance that avoids possible degradation of the target peptide in gastrointestinal tract (43, 44). In both cases, Ag-specific tolerance involves multiple mechanisms including “suppressor” T cell responses, anergy, and activation-induced cell death; the relative contribution of each depending on factors such as dose, timing, and the identity of the Ag (29, 30, 31, 41, 42, 43, 44). In the current study, we demonstrate that, despite the immunopathological complexity of MOG-induced EAE, intranasal application of a 1:1 mixture of the encephalitogenic MOG peptides, MOG74–90 and MOG93–110, has a dramatic effect on the severity and clinical course of MOG-induced EAE. Moreover, this effect is maintained when MOG74–90 is replaced by its BTN homologue, BTN74–90. The mechanistic details responsible for this clinical effect are currently being analyzed, but these results provide the first indication that transmucosal sensitization to a BTN peptide can modulate the effector T cell response to MOG. A suggestion supported by our observation that treatment with high doses of the BTN peptide also suppresses EAE mediated by the adoptive transfer of MOG74–90-specific T cells (45). We anticipate that a similar tolerogenic effect may also occur in the adult following the consumption of bovine milk products, in which case BTN in the diet may not only induce oral tolerance to BTN itself, but also suppress cross-reactive and potentially encephalitogenic MOG-reactive T cell responses. However, such an effect will require a permissive MHC class II haplotype and be further complicated by factors effecting the degradation and uptake of BTN peptides in the gastrointestinal tract before its immunological processing and presentation. However, the mechanisms responsible for oral tolerance are poorly developed at birth, and, in the neonate, feeding Ags may initially prime the immune system rather than inducing tolerance, oral tolerance only developing if feeding is continued beyond a critical age (31). In the case of an autoantigen, this raises the possibility that neonatal exposure may enhance disease susceptibility later in life. This was clearly seen in rats fed MBP for a limited period immediately postpartum and then subsequently immunized with MBP in CFA in adulthood (46). These animals not only exhibited no tolerance to MBP-induced EAE, but also developed more severe disease than control littermates. In contrast, feeding MBP to adult rats induced oral tolerance and suppressed MBP-induced EAE (46). The role that timing of exposure and the differential effects of syngeneic BTN as opposed to xenogeneic BTN have on the T cell response to MOG is currently under investigation in BTN−/− and wild-type mice. Intriguingly, the frequency of seropositive responders to milk proteins peaks in childhood and declines as puberty approaches (47), a time frame similar to that reported for the role of the environmental factors in the etiology of MS (1, 48). Moreover, epidemiological studies have identified an association between the consumption of milk and the prevalence of MS (32, 33, 34). However, whether or not this is related to molecular mimicry between BTN and MOG must remain a matter of speculation. Indeed, milk in the diet is only one of many environmental factors related to the prevalence of MS (48). Moreover, this simple explanation neglects the existence of multiple BTN homologues that are encoded together with BTN telomeric of the nonclassical class 1 MHC locus (23). Mimicry involving the N-terminal domains of these proteins, which are expressed in a wide variety of tissues, may also influence the composition and function of the BTN/MOG repertoire. In conclusion, we identify BTN as an Ag that can influence the clinical outcome of autoimmune responses to MOG, an important antigenic target in EAE and MS. Modulation of the MOG-specific repertoire as a consequence of molecular mimicry with this dietary Ag BTN may be a significant factor in determining the role MOG plays as a target Ag in the immunopathogenesis of MS. Identification of those MHC haplotypes permissive for a cross-reactive T cell response between MOG and BTN may provide a strategy to identify those at risk of developing encephalitogenic responses to MOG following premature exposure to BTN. We thank Drs. Roy Mariuzza and Marina Lebedeva (Center for Advanced Research in Biotechnology, Rockville, MD) for help in producing BTNIgV and Dr. Hartmut Wekerle for his comments and enthusiastic support. ↵1 This study was supported by grants from the European Union (Biomed 2; Contract No. BMH4-97-2027), the Deutsche Forschungsgemeinschaft (SFB 217, Project C14) (to C.L. ), and the U.S. Department of Agriculture (9703618) and the Maryland Agriculture Experiment Station (AASC-98-15) (to I.H.M.). ↵2 A.S. A.Sc. and M.S. contributed equally to this paper. 4 Abbreviations used in this paper: MS, multiple sclerosis; EAE, experimental autoimmune encephalomyelitis; MOG, myelin oligodendrocyte glycoprotein; BTN, butyrophilin; MFGM, milk fat globule membrane; TCL, T cell line; d.p.i., days postimmunization; DA, Dark Agouti; BN, Brown Norway; LEW, Lewis.